Ann-Marie LeQuesne worked with members of the public to present At Table, a series of four live performances, spread over an afternoon. Working with a different cast for each performance, she asked participants to form a tableau vivant of the painting seen above—mimicking the postures and expressions of the numbered characters in the image. Referencing the practices of filmmaking, each performance became a “take” and the roles of the characters evolved as subsequent participants considered what they might bring to their particular role. 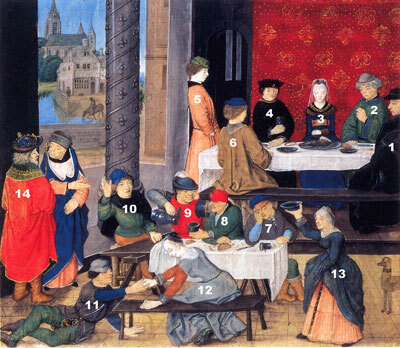 The painting shows two approaches to drinking: drinking in excess (lower table) and drinking with restraint (upper table). It was painted as a “morality” lesson and lends historical perspective to current debates on how/if the state and/or the church influences individual behaviour. Participants chose their role from the fourteen numbered characters seen above. 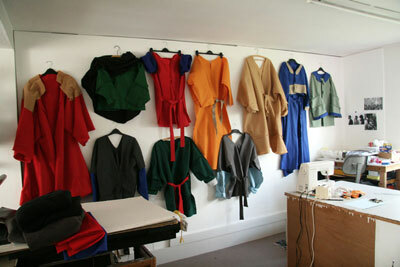 Medieval hats (carefully modelled on those seen in the painting) were commissioned and LeQuesne made one-size-fits-all costumes that participants wore over their own clothing. Characters entered the set sequentially accompanied by live and pre-recorded number choruses* as backing tracks. The live music was sung by Muriel Louveau who took the role of the character standing on the left, dressed in blue and pointing out the difference in behaviour between the tables. A composite video was made of the performances and still photographs of the resulting tableau vivant were taken at the end of each performance. * LeQuesne recorded groups of people speaking the numbers one to fourteen. She edited these voices into rhythmic groupings and worked with Shyamal Maitra to add individual percussion to each chorus.